Venerable Mary Angeline Teresa, O.Carm. We have chosen this theme in order to highlight the mercy which Mother Angeline demonstrated in her careful and generous care of the elderly, the vulnerable and the infirm. 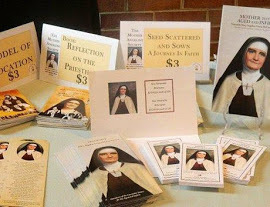 As the Church enters into the Extraordinary Jubilee Year of Mercy from December 8, 2015 until November 20, 2016, it seemed natural to recall the mercy which characterized the virtues of Venerable Mary Angeline Teresa, showed in the charity, magnanimity and forgiveness that marked her living and her ministry. All that we do to protect life and care for those who are most fragile in our society proclaims anew the mercy of Christ and His Church for all God’s people. Very Reverend Mario Esposito, O.Carm.